22-Sep-2010 -- As I had that afternoon arrived in North Dakota for several days of workshops about GIS and spatial thinking and analysis, and as I needed to incorporate some fieldwork into my upcoming presentations at Bismarck State College and in three local high schools, I thought that a confluence visit would be the perfect starting point. I identified the closest point to Bismarck which did not look like too major of an expedition. Little did I know that the trek there, like many of these treks, would hold lots of little surprises, and turn out to be longer than expected. I wondered why nobody had visited it in many years. Upon reflection after having visited it, now I knew why. All was well as I flew into the airport, but was a bit dismayed to see the gray rainy skies. Undaunted, I picked up a rental car, leaving the airport and listening to an AM radio station that broadcasts historical information about the bridge across the Missouri River, 24 hours a day. I drove west across the Missouri River on I-94 to State Highway 25. The only item of concern was the rain that was falling on and off during the whole journey. Fortunately, I had brought a coat and was wearing non-work clothes. Driving north, I soon left the city behind except for a few exurbanites, and crossed the county line without seeing my desired road to the east, only driveways. I drove far beyond the 47th parallel before I found a road heading due east, but was marked as a dead end. I made a U-turn and drove south the way I had just traversed, finding no roads until far south of the confluence, which I took east to State Highway 1806. I followed 1806, which parallels the Missouri River on its west bank, to the north. One road looked promising but landed me in a small subdivision, and once again, I drove north, along 1806, looking for roads to the west. 1806 ended and became the gravel "River Road." Finding no roads that would work, I reached the crossroads of River Road and 22nd Street Southwest, where once had stood a town. I then drove due west along 22nd Street Southwest, and crossed the 101st Meridian for the 3rd time that day. Before I arrived back on Highway 25, my progress was impeded by a large combine that was undergoing repair and blocking the entire road. I sat there awhile before they were able to pull over a bit. I continued back to Highway 25, where I turned south and drove back to 25th Street Southwest. I had now made an entire circumnavigation of the confluence and time was quickly passing, the gloomy day becoming darker. Deciding to abandon search for the elusive road I had been seeking, I drove due east on the gravel 25th Street Southwest until I reached a dumpster, which was interesting as it looked out of place in this remote area. I could have tried again to find a closer road, but in truth, I was eager to quit driving and start hiking. After the dumpster, road conditions quickly worsened with the rain and mud, and as I crested the hill, I looked for a place to turn around. Successfully doing so without getting stuck, I gathered supplies and prepared for quite a hike. The GPS said over 3.3 miles (5.3 km) lay between me and the confluence point A light rain was falling, and as I started down the road to the east, on foot now, I was surprised to see, in the valley ahead of me, a pair of trucks in the distance. I then struck out due south, into the field, and from the sounds in the distance, it was clear that the workers were trimming trees. The sky conditions darkened and I was becoming quite wet, especially given the fact that the grasses were occasionally nearly a meter high. The hike was enjoyable, though, with temperatures just about perfect, perhaps a bit cool, but much preferable than in the midst of winter or the midst of summer. Temperature extremes were common here in North Dakota, about equidistant from the Atlantic and the Pacific. I climbed a small rise, and descended a small valley, and repeated this process several times, with great views to the south that were a bit impeded due to low hanging clouds. I angled to the southeast until I came upon a long barbed wire fenceline running due north-south, which I decided to follow due south as far as was practical. The reason is that I knew there would be a cattle trail running alongside it, which allowed for a bit faster progress, though I did nearly entangle myself in trimmed portions of barbed wire lying on the ground several times. Be careful! It would not do to twist an ankle way out here. The land descended into a valley that was covered in a sunflower field, which would have made for a beautiful photo but the gray skies were washing out most color. I crossed the fence and once more angled to the southeast, and once over the next rise, finally set eyes down the long valley to the reservoir where, on the far side, I knew the confluence point lay. A decision was needed now: Take the west side of the reservoir or the east side? Knowing the confluence was on the east side, I chose that direction, but quickly regretted it: After crossing a one-lane road, the terrain was quickly becoming much more rugged, as well as muddy, which nearly sent me sprawling several times. There were a few mud flats that I traversed which would have looked quite comical to an observer, with me slip-sliding away. What slowed me down the most were two major inlets of the reservoir, which I did not see until rounding the shoreline bend, which took me far off course. At times I thought the confluence point was going to be in the water. At last I rounded the last bend, and came upon the shore that was within 100 meters of the goal. I was directed up a steep slope for these last 100 meters and nearly to the crest of the hill. It was there that I found the confluence. I was just over 80 minutes into the hike and it was well worth it. I had magnificent views in all directions, but particularly to the west, over the reservoir, and to the valleys to the south. The temperature was 54 F (13 C) under gray skies, which fortunately had lightened a bit in the past hour. I was still quite wet, but the rain had slackened. It had been six years since my last confluence trek in North Dakota in a wintry field to the south of here. I had missed this great state! I had never before stood at 47 North, but had stood several times at 101 West, from the Dakotas down to Kansas. While I would have liked to stay, I was uncertain what the weather was going to do, and I had a long hike back to the vehicle, with a great deal of teaching preparation work to do back in the hotel. Therefore, I spent less than 15 minutes on site. It was clear from my vantage point that the west side of the reservoir would make for more rapid progress, so I descended the hill without incident, crossed the dam, and hiked up the slow rise to the northwest, on the west side of the reservoir. As I crested the hill, I took a few last photographs of the confluence point. Ten minutes later, I reached the one-lane road, and decided to take it to the north. It would be longer to reach the vehicle this way, but if the road was the one I suspected it was, I could take it all the way back to the vehicle. My feet were getting sore and the road was a bit easier than the tall grasses and uneven terrain. Still, it seemed like I made slow progress, and it was a good hour before I reached the turn in the road that led due west. It was enjoyable though, especially as the rain continued to slacken. I passed a livestock holding pen and under a powerline, and then found where the tree trimmers had been. Ten minutes later, I was a bit dismayed to see the tree trimmers' 2 trucks parked next to my rental car at the crest of the hill. They were so intent on cleaning their machines that I had to shout my greetings to them. Fortunately, they had just chosen that site as I had, and did not care in the slightest, nor were they curious, about why I was hiking on a rainy day in the middle of fields. The small crew were from various parts of the state and I pondered what it must be like to have a job like this, where you can work in many landscapes and in many locales. Not a bad job, but in North Dakota you could certainly be working in any sort of weather condition. I bade them farewell and drove back west to the state highway, trying not to get the whole interior of the rental car muddy. I later uploaded my track points into ArcGIS Explorer and used it in my keynote address at Bismarck State College two days later. As I drove back south, I did spot a private road heading east, and upon checking the online map that evening, after putting some dry clothes on, this was indeed the road I had been seeking. Had I driven up it, I could have done the whole hike in an hour. But I would not have had the experience of an extended hike across the grasslands. Get out there and explore the Earth! #1: View to the west from the confluence point. #2: View of the confluence from 500 meters to the northwest, looking southeast. 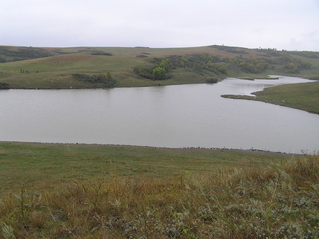 The confluence is on the far side of the reservoir, on top of the first bluf in center-right. #3: View to the south from the confluence point. #4: View to the east from the confluence point. #5: View to the north from the confluence. #6: Wet GPS at the confluence point with the reservoir in the background. #7: Soggy but successful arrival at the confluence point. #8: Ground cover at the confluence point. #9: Moody view of the bluffs to the south-southeast from the confluence. #10: 360-degree panorama movie with sound filmed at the confluence (mpg format).